TEMPE – Outside linebacker John Abraham, the NFL’s active sack leader, is returning to the Arizona Cardinals after a possible concussion suffered in the season opener had him contemplating retirement, coach Bruce Arians said Monday. “He’s excited about it and he’s at the doctors now to make sure that he can pass the test and be back and ready to go,” Arians said. Abraham, 36, missed Sunday’s win over the New York Giants. Arians has said Abraham told him he needed to figure out whether his heart was still in the game. Abraham, who suffered the injury in the Cardinals’ week one victory over the San Diego Chargers, decided to return after talking with teammates and texting back and forth with Arians, the coach said. Abraham, who played most of his career with the New York Jets and Atlanta Falcons, has 133.5 sacks in his 15 seasons, including a team-leading 11.5 for the Cardinals during the 2013-2014 season. He will be re-inserted into his starting position right away, Arians said. With Abraham the leading pass rusher, his decision to return bolsters a defensive front that’s reeling from injuries. The Cardinals recorded no sacks against the Chargers, and they had two against the Giants while not applying as much pressure as Arians wants. “We really played poorly defensively, much below our standard,” Arians said. While the Cardinals can count on the return of one injured player, quarterback Carson Palmer’s return date is still uncertain. He was a late scratch against the Giants because of nerve trouble in his throwing shoulder. Arians said Palmer wanted to play in Sunday’s game, but his arm just wasn’t ready yet. Drew Stanton, playing in his first game since 2011, completed 14 of 29 passes for 167 yards. He had no touchdowns but had no turnovers. Arians said he wasn’t surprised by the performance. While the team sealed a second win, Arians said he was disappointed with the overall performance of the offense and defense on Sunday, adding that the team will be working to improve for Sunday’s home game against the San Francisco 49ers. The Cardinals have one more game before their bye week, and Arians said the team is working to hold on to first place in the NFC West. 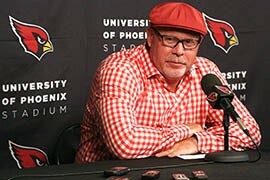 Arizona Cardinal's coach Bruce Arians answers questions at a news conference Monday.